[H]er real venom is reserved for Jewish settlers on the West Bank and their supporters…who are depicted as lawbreakers and wreckers of world traquility…Since a significant portion of the segment is devoted to Jewish terrorism, one could get the impression that it is somewhat common, instead of a freakishly rare phenomenon that, when it occurs, is almost universally condemned by Jews worldwide. Surely she would never depict Arab-Americans who care about ordinary Palestinians as a unified bloc of terror-supporters. So why does she depict settlers and their supporters as a bloc of people who undermine world peace? Surprised that Wesley Clark is against bombing a terrorist regime in Iran and is blaming the Jews for a military response being a real possibility? Too bad no one paid attention when Clark’s ethnic target was the Serbs…if the Jews are the canary in the mine, the Serbs have been the canary’s canary. Working to ensure a mono-ethnic Kosovo, Clark warned that “a violent collision may occur by year-end” if we don’t give the Albanians what they want (independence without standards ala Palestine). And this four-star general advocated doing just that. “CNN’s Ms. Amanpour was at the top of the list of those correspondents who parked their backsides at the Holiday Inn in Sarajevo and relied on Muslim runners to collect the data for their stories. Nearly all journalists who went to Bosnia could not communicate in the language of the country and the vast majority relied on Muslim translators for their so-called facts. This is vividly demonstrated, along with Amanpour’s crimes against humanity in the Balkans, in Peter Brock’s book Media Cleansing: Dirty Reporting . When it was time for the West’s Kosovo leg of Serb slaughter, Amanpour befriended Muslim-Albanian terrorist and current Western-backed leader Hashim Thaci. Christiane Amanpour has yet to inform her viewers of this fact, but continues to allow them to believe the massacre was a Serbian atrocity which United States and NATO used as an excuse to drop more than 6,000 tons of bombs on the Bosnian Serbs. Another big CNN story early in the Bosnian conflict was the killing, allegedly by Serb snipers of two “Muslim babies” on a bus. Who could not have been horrified by the tragic sight of the funeral service for those innocent Muslim babies? Where were Ms. Amanpour and CNN to set the record straight? If it had not been for French 2 TV that covered the funeral, this writer would never have known that the babies were Serbian (not Muslim) killed by a Muslim sniper, as was made painfully clear by the presence of a Serbian Orthodox priest conducting the funeral service. . . before it was interrupted by a grenade attack. However, in the CNN coverage the priest had been cropped out, leaving the American audience to believe that Serbs were not only the assassins, but were also responsible for the grenade attack. Had I known nothing or even very little about Jewish, Zionist and Israeli history I would have come away from former MP Paddy Ashdown’s two-hour documentary on British Channel Four’s primetime Saturday slot thinking the Jews are just about the most disagreeable race on this planet. Were I an Arab or Muslim I would believe the Jews of the Holy City are the scum of the earth. Once again a British television programme has taken the complex and tragic story of Israel and turned it into a polemic about the endlessly victimised Palestinians and those brutal, hate-filled, despicable Jews…. As Israel watchers may or may not know, Ashdown was the UN High Representative overseeing Bosnia from 2003 to 2005, during which he worked toward wiping Bosnia’s Serb Republic off the map. Like Israel, which is surrounded by monstrosities that pass for states, “Republica Srpska is the only part of Bosnia-Herzegovina where the rule of law applies, and where there is productivity, ethnic and religious tolerance,” as Defense & Foreign Affairs Daily put it in 2004. In an interview in the International Herald Tribune Ashdown compares the administration of peace in Bosnia to the occupation of Germany and Japan after 1945…Ashdown thus compares the Serbs (who were our allies against German Imperialism and European fascism in two world wars) with the Nazis. He equates the Bosnians, Croatians and Albanians (who were fascist and Nazi allies) with peace loving democracies!…Most dangerous of all…Ashdown sees Muslim revolutionary fanaticism as the vanguard of democratic nationhood and world peace! No wonder he and his ignorant British and American sponsors have ushered into Europe via Albania and Kosovo some of the most dangerous and violent Islamic movements in history. Creation of “a stable state” in Bosnia depends on the Serbs accepting their assigned role as Nazis. That the “Bosniaks” and Croats were the actual Nazis, back in WWII, is the kind of history that does not interest Ashdown. He gave evidence about his four day visit to Kosovo in 1998 and claimed he was a witness to atrocities allegedly carried out by the Yugoslav Army. He claimed he had witnessed these events from a position above the village of Gegaj in Albania overlooking Kosovo. But when he was told that from his observation point it was impossible to observe the area he claimed, he changed his story and said in fact he was somewhere else! After it was proved in court that Ashdown could not possibly have seen anything from the position he had previously claimed, above the Albanian village of Gegaj, he supplied the court with grid co-ordinates different from his original testimony, and these new co-ordinates put him inside Kosovo and not in Albania…Moreover, on the map the prosecution supplied to try and verify Ashdown’s testimony the village of Gegaj had been moved! When challenged on this point the prosecution reluctantly admitted it may be a faulty map! He became the father of his people — the person who did more than any other to ensure the survival of the modern state of Bosnia and Herzegovina. 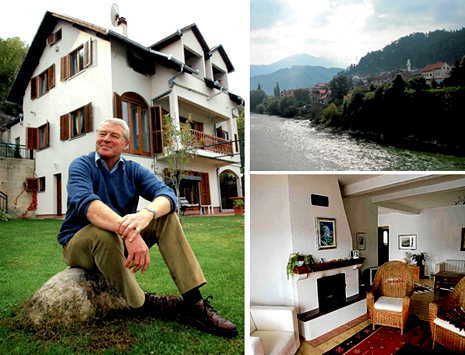 Ashdown gazing out onto his handiwork in Bosnia from his lakeside home, a minaret visible in the distance. Ashdown overlooking the Holy Land, the Islamic Dome of the Rock visible in the distance. The Jewish state’s Western enemies have a history of enmity toward the Serbs. If they’re not already doing so, Israel watchers must pay close attention to what has happened, and continues to happen, to the Serbs — and choose sides.